A couple of hours in my favourite gudgeon hot-spot this afternoon, trying to add one to this years River Wandte species list - but as always, when you fish for them they never turn up. 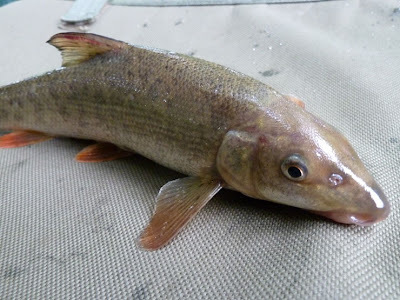 I did have a few chublets and the gudgeon's larger cousin - I thought for a second I'd caught a monster - turned out to be another baby barbel about 6 or 7oz. 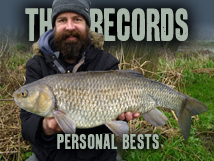 Meanwhile, Darren added a 3lb 10oz barbel to his season. Last season I managed 10 species of fish, a number I'm hoping to better this year. First column is this season, second column is previous seasons. I've caught 5 species so far this year, most of the easy ones. And adding the 'Seen' column makes fish-spotting more interesting! I thought zander was on your wish list. There aren't any sander in the Wandle, I'm heading to the Thames for one of those... So many fish to catch, so little time! I think all the Gudgeon have gone on holiday to warmer climes...either that or they have all been washed away in the floods. I had a couple of Stickleback out last season from one particular swim, but they are definetly not a common fish in this river. Sorry, missed this comment. Gudgeon never seem to show up when you fish for them, if I'd have just said I was fishing for roach I bet I'd have got one! I think stickleback and stone loach are going to be pretty tough to get, not only are they rare they have such tiny mouths and I don't think I've ever fish less than a size 16 hook on this river. I'll settle for the 'Seen' section.